Description: Colt Government Model Semi-Auto Pistol serial #99773G70, 45 ACP, 5" barrel with an excellent bore. This MK IV series 70 pistol retains about 99% original blue finish with a few minor handling marks and scattered light impact marks on the rear sight. The checkered walnut factory grips with gold Colt medallions rate very good to excellent with scattered light handling marks. The front sight is original but the rear sight is a white outline drift adjustable that is a near clone of the factory's save for the white outline. This pistol features the collet style bushing with the remaining features similar to the 1911A1. The pistol includes a single Colt marked magazine. 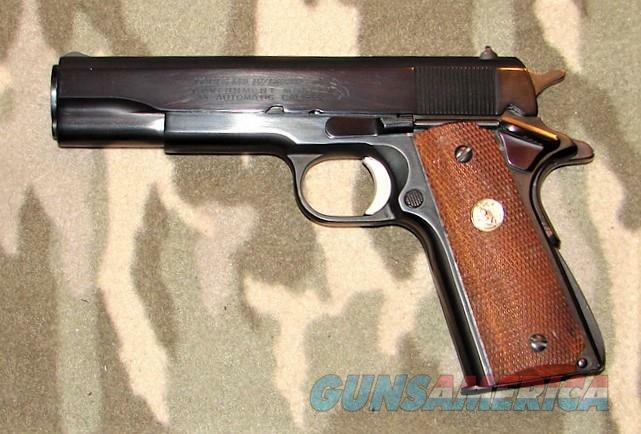 Overall, an excellent example of a 1979 made government model pistol.